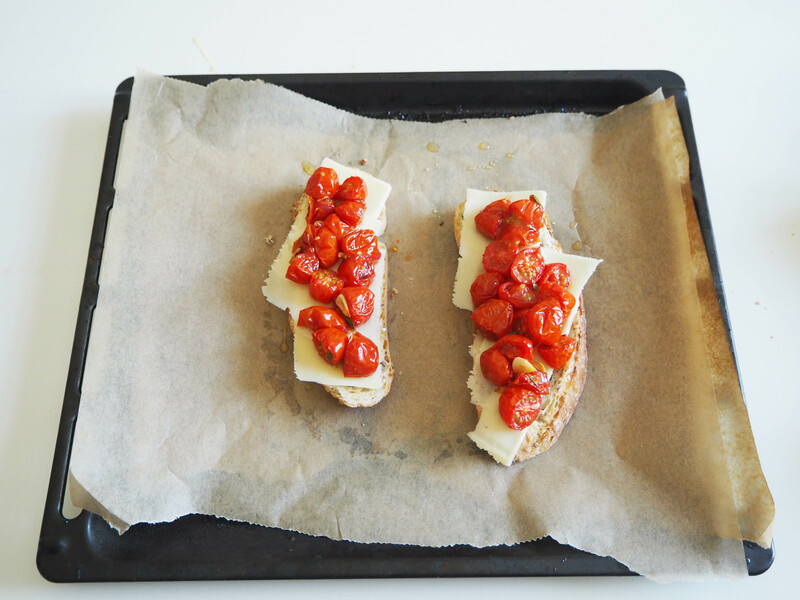 Roasted Garlicky Tomato And Cantal Tartine – Easy Nam, Anyone? I love simple tastes and the pleasure that comes from them. 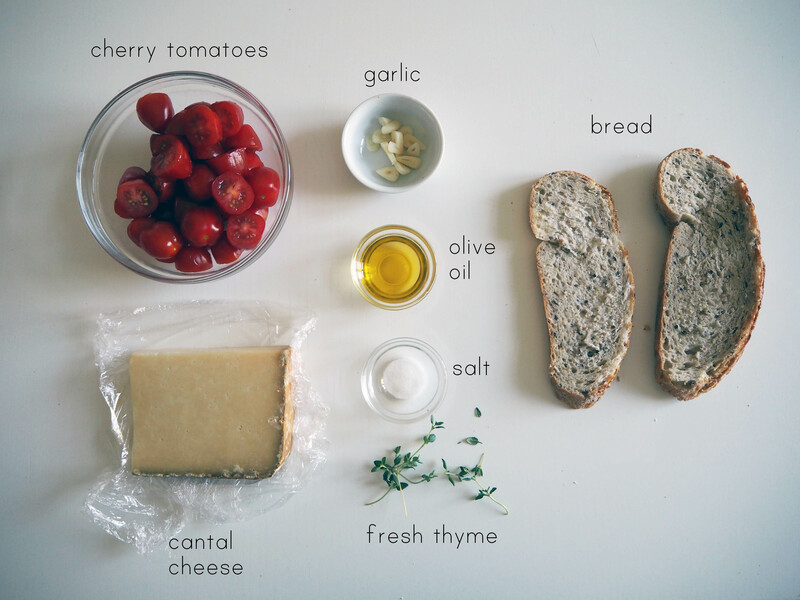 Preparing a tartine, aka open sandwich, is a very easy task – even when there is a variety of ingredients involved. And the result, particularly with a good quality bread, is exquisite. I am very much interested in open sandwiches nowadays. For many years, the idea of a sandwich for me was limited to classics – a bunch of ingredients in between two pieces of bread, or within one big slice. Don’t get me wrong, I still love it. 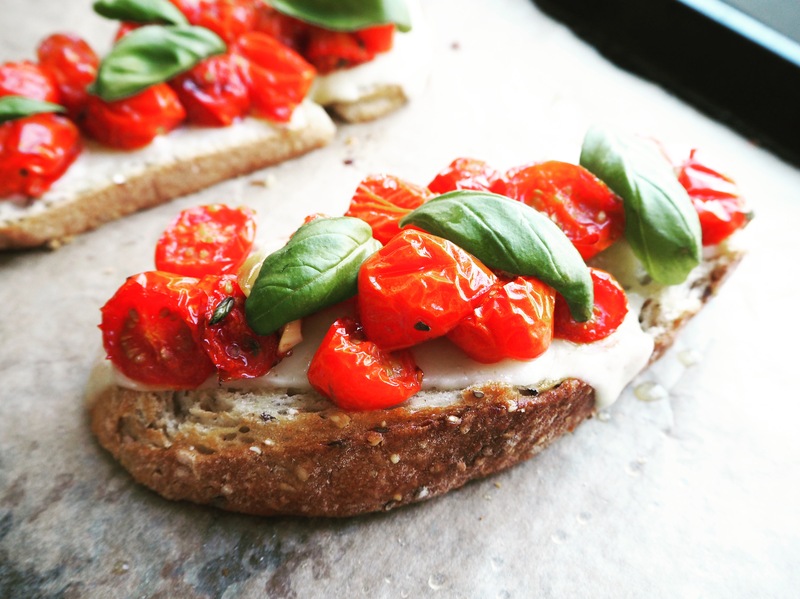 But there is something so elegant and so attractive about an open sandwich, that I now prefer it to the other one. 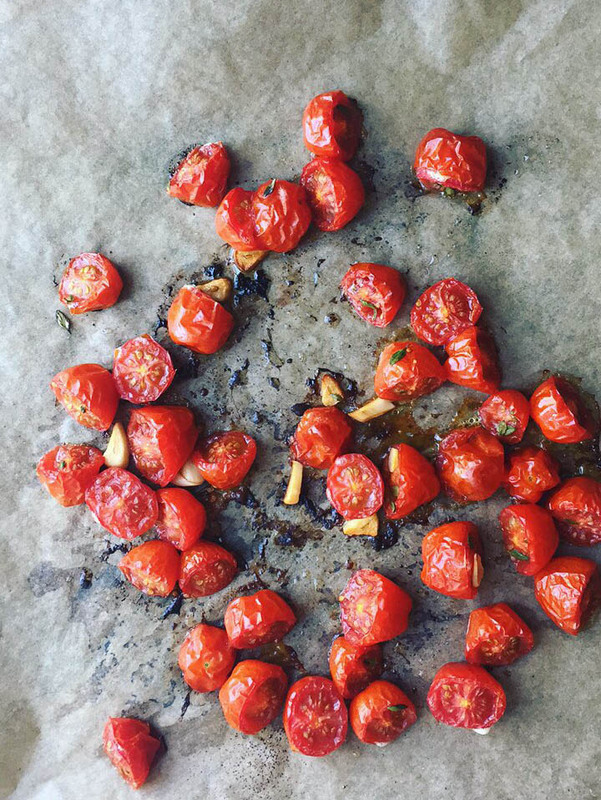 Since I love tomatoes more than anything in the world, the first tartine recipe I wanted to post was this one. 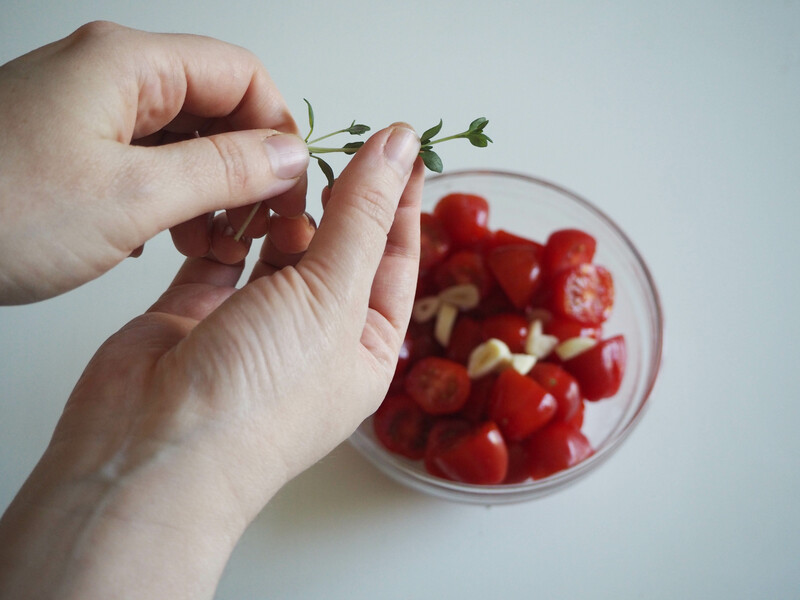 I love tomatoes in any form but together with garlic, fresh herbs and of course olive oil, roasting takes tomatoes in a whole different level! 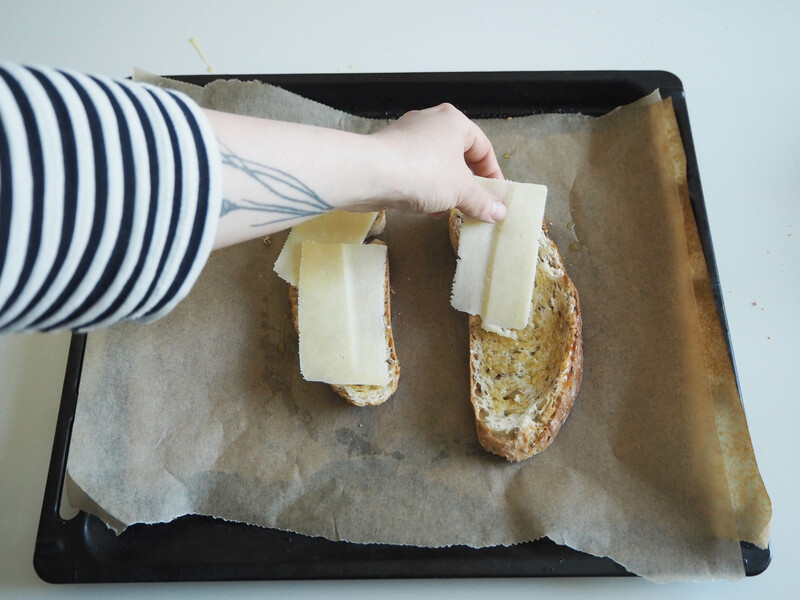 I also used one of my favourite cheese types, cantal, for this recipe. You can use another hard cheese if you have another favourite one, or if you cannot get a hold of cantal. I first tasted cantal when there was a mini food festival in Kamppi in the centre of Helsinki and I am so happy to see that nowadays you can easily find it in Stockmann’s cheese section, which offers quite good selection of cheeses. Alright, no more words, let’s get to the sandwich! Enjoy! 2. 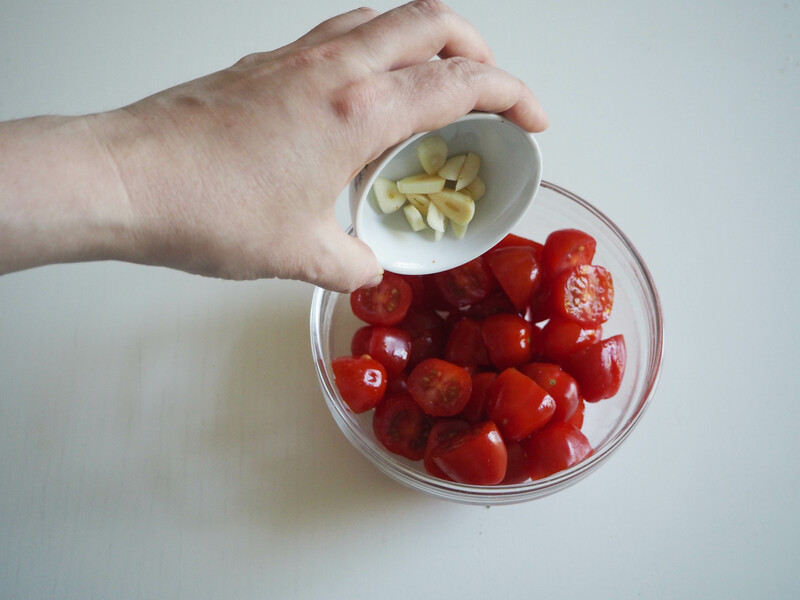 In a bowl, mix tomatoes, salt, garlic, thyme (only the leaves) and olive oil. 3. 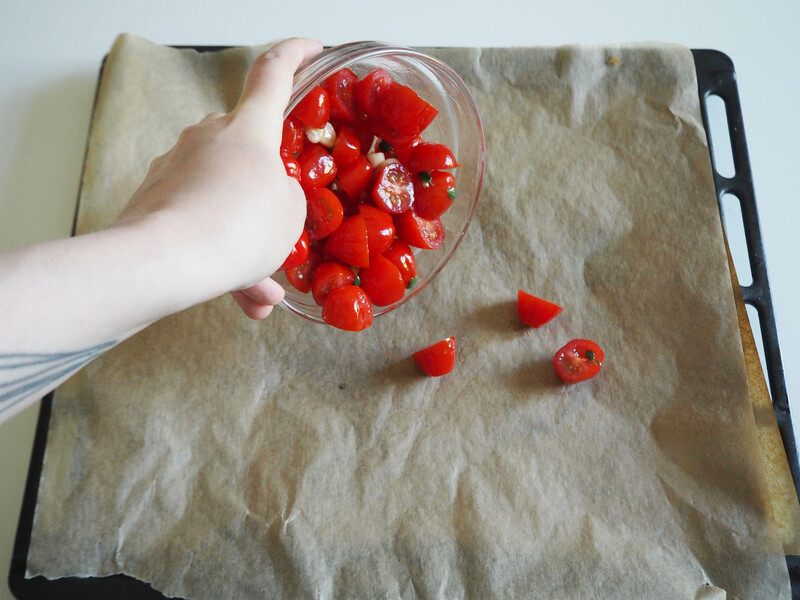 Prepare an oven tray with baking paper. 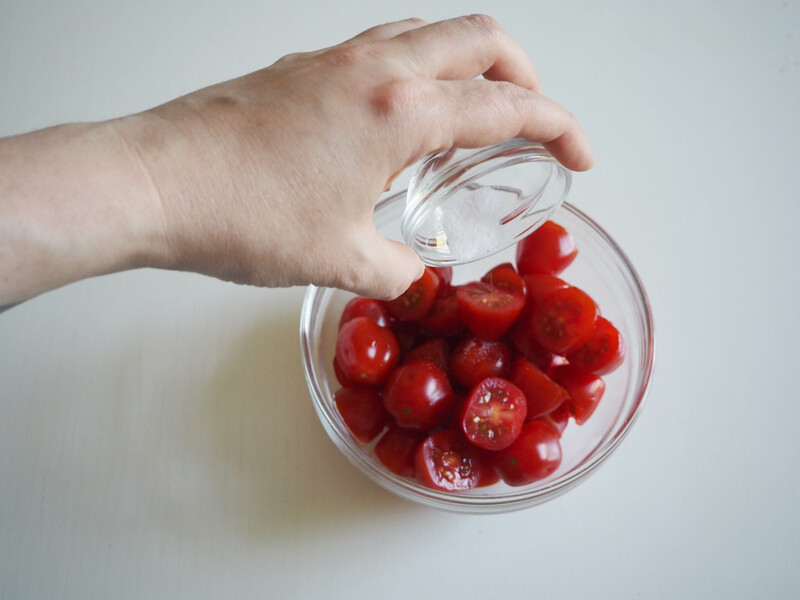 Put tomato mixture on the paper, in 1 layer. 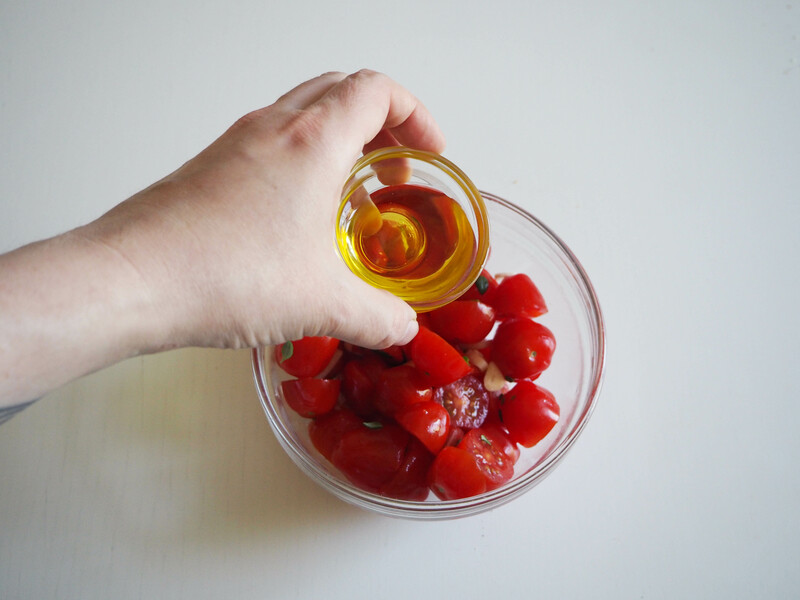 Any olive oil left in the bowl, pour it over the tomatoes. 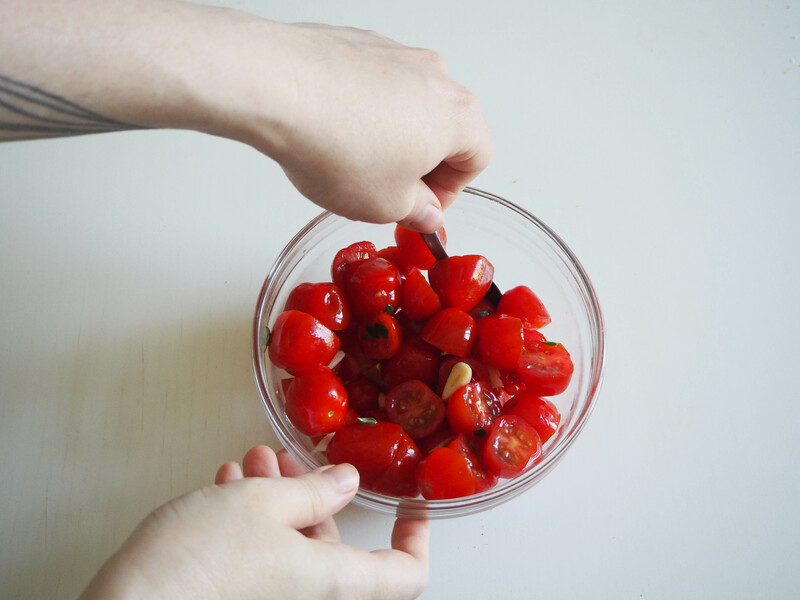 Put in the oven in medium rack for 20 to 25 minutes, until tomatoes gets soft and juicy. Then take out of the oven and put aside. 4. 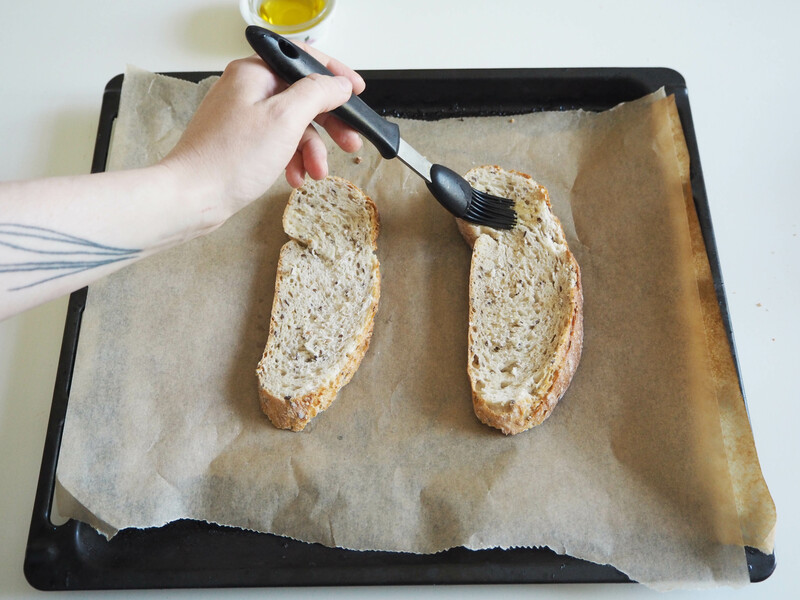 In another oven tray with baking paper, put bread slices and brush both sides with olive oil. 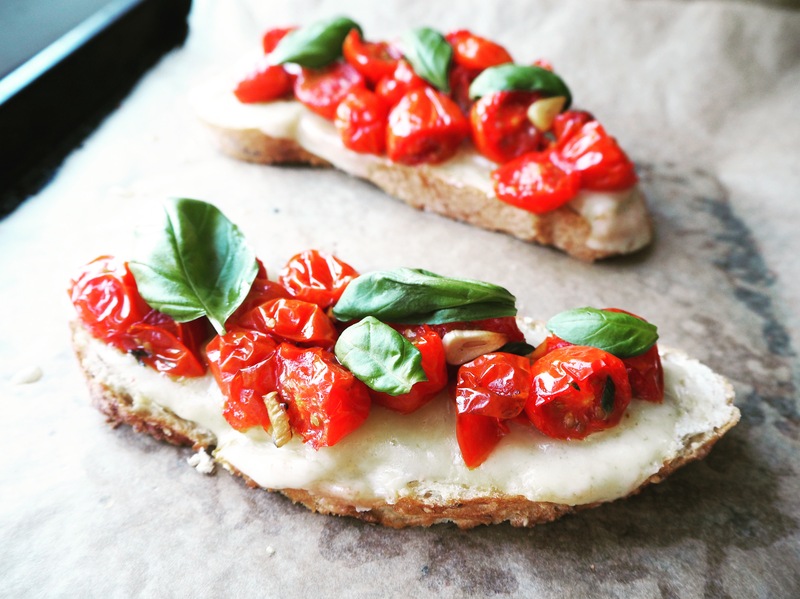 Put cheese slices on top and then add roasted tomatoes. Put it back in the oven, for 5-7 minutes, until cheese melts. 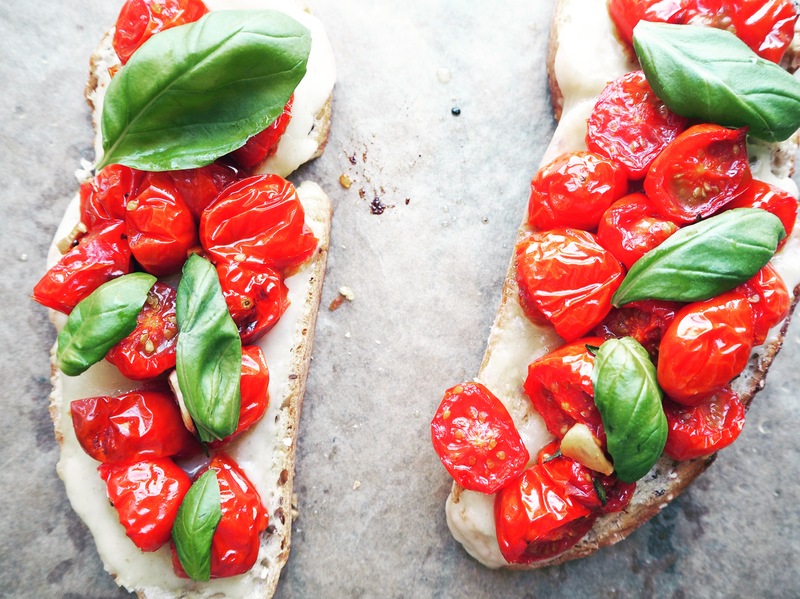 Serve with fresh basil leaves. Enjoy!